For Myles Stephens and his teammates on the Princeton University men’s basketball team, their 71-60 defeat at George Washington earlier this month proved to be a wake-up call. As the Tigers hosted Monmouth last week in their first outing since the GW game, that renewed focus wasn’t apparent right away as the Hawks jumped out to a 16-3 lead. But responding with a 20-2 run, Princeton led 31-26 at halftime and never looked back on the way to a 69-58 win in the December 12 contest before a crowd of 1,549 at Jadwin Gym. Stephens helped trigger the triumph with some deadeye shooting, hitting 5-of-9 three-pointers on the way to a game-high 19 points. On the defensive end, Stephens made a difference as well, helping to hold Monmouth star Micah Seaborn to eight points. In Stephens’ view, a team-wide commitment to defense made the difference against the Hawks. Princeton head coach Mitch Henderson didn’t hedge when assessing the importance of the triumph for the Tigers. “I know that is a good Monmouth team and that is a really good win,” said Henderson. Henderson was heartened by the resolve the Tigers displayed in overcoming the early deficit. “I am so happy, that with where we have been recently, we were up five at half after being down 16-3,” said Henderson. 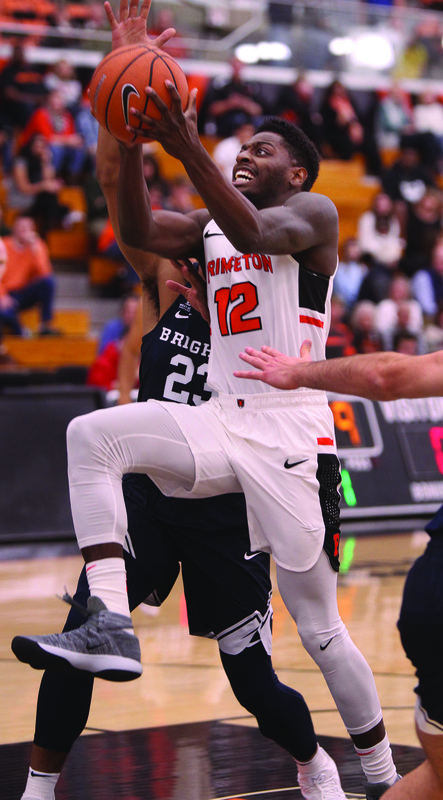 Princeton seemed to be most in synch as a team down the stretch when Henderson went with his big three of Stephens, Cannady and senior guard Amir Bell along with a pair of freshmen, Sebastian Much and Ryan Schwieger. “I think that is the right group,” said Henderson, who got nine points and five rebounds from Much with Schwieger adding eight and four steals. The skills of Stephens at both ends proved to be a key factor for the Tigers. Cannady hit some big shots, ending up with 18 points, including two three-pointers in the last 1:40 of the contest. Cannady, for his part, was content to focus on setting up his teammates until things opened up for him in crunch time. “If guys want to guard me that close, then I can cut and get other guys open,” said Cannady. Although Princeton has taken some knocks in its non-conference schedule, Henderson believes that is the best way to toughen up his squad. “I love it but it creates some tough conversations when you are 2-6 that these guys can have with each other and with me,” said Henderson, whose team moved to 4-6 with the win over Cal Poly and was slated to play at Southern Cal on December 19 and then compete in the Diamond Head Classic from December 22-25 in Honolulu, Hawaii. Cannady, for his part, feels the Tigers are taking those lessons to heart. “We are not determining your success on the wins and losses at this point,” said Cannady.